Personal Trainers who graduate from the CSNA Education Program are certified to create meal plans, teach clients how to eat better for health and weight loss, and provide expert advice on the correct use of dietary supplements and natural health products. The best personal trainers today have knowledge not only in physiology, anatomy, kinesiology and body mechanics, but also nutrition science, biochemistry and functional medicine. Coaches who graduate from the CSNA Education Program are certified to teach athletes how to supply their unique biological demands. Coaches can help their athletes perform better, reduce injury risk and get leaner through improved nutrition. Athletes who eat as hard as they train function and perform better, especially masters age athletes. Learn how to reduce inflammation, improve training recovery and master the art of hydration. Health professionals who graduate from the CSNA Education Program are certified to teach patients and clients how to eat better and use natural health products to improve overall health and wellness. Health professionals include doctors specializing in functional medicine, sports medicine physicians, chiropractors, physiotherapists, naturopaths, herbalists, etc...Holistic sports nutrition is a function of motivation and inspiration through education. 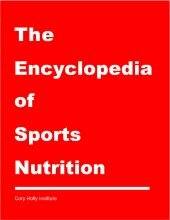 The Encyclopedia of Sports Nutrition is the perfect reference guide for personal trainers, health food store retailers, health professionals and athletic coaches. Excellent for quick iPad application, eReader and sports nutrition quick search. Over 1100 pages in PDF format. Holistic, integrative and functional! Covers every known aspect of sports nutrition research. Excellent fitness and nutrition resource for personal trainers. Required reading for those searching for optimum health guidelines. A must read reference guide for young, middle age & master level athletes.